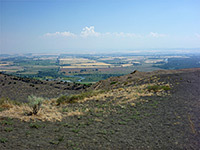 The Menan Buttes are a pair of isolated cones of volcanic tuff (formed when lava erupts through water) overlooking the Snake River in southeast Idaho, near Rexburg, rising 800 feet and visible for many miles across the surrounding flat lands, especially from the west, where for long distances the ground is covered by level lava deposits. 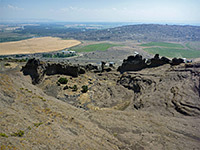 The crater-topped buttes resulted from eruptions around 10,000 years ago, and are roughly conical though somewhat elongated to the northeast as a result of prevailing southwesterly winds during their formation. 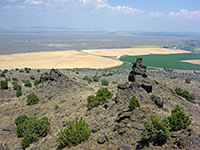 The southern, slightly lower summit is privately owned but North Menan Butte lies on public land, managed by the BLM, who maintain a trailhead on the west side, for a steep half mile path to the crater rim, which is circled by a 2 mile loop. 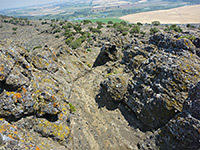 The butte is by no means a major tourist destination, popular mostly with locals, though it is notable both for the long distance, unobstructed views from the summit, as there are no other peaks nearby, and for the volcanic features en route, which include outcrops of jagged, intricately-textured rocks, even though much of the surface of the peak is dusty, earthen and partly overgrown. The Menan Buttes trailhead is reached by a quiet country backroad, forking south from Hwy 33; this crosses farmland to the parking area a little way up the western slope, from where the crater rim rises 500 feet directly ahead. The path is steep, mostly lacking any switchbacks, instead heading straight up the hillside, and is aided in one place by chains. The ground is liable to be dusty, the path covered by loose earth and stones, so the route is slippery, especially when descending, and all of the hillside is exposed and very hot in summer. The surroundings become rockier towards the top, where jagged outcrops of brownish, glassy tuff rise up. 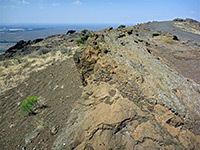 At the rim, the ground ahead slopes down 200 feet to the floor of the shallow crater, while the rim extends all around, lowest directly opposite, on the southeast side, highest to the northeast and southwest. 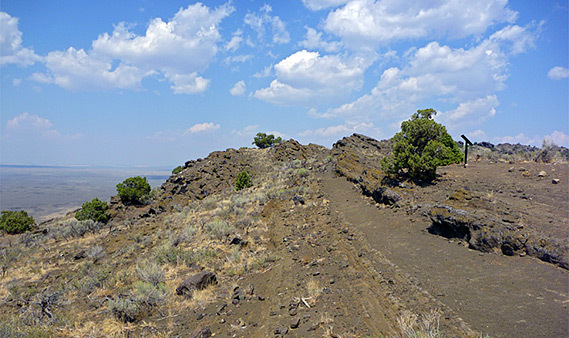 The summit to the north is the site of a communications installation, which spoils the natural appearance somewhat, and causes the rim trail to divert downhill for a few hundred feet. The most impressive, vegetation-free volcanic deposits are towards the south side of the rim, once site of a vent, as is explained by one of several interpretive notices along the way. The rocks exposed along the rim and the upper part of the approach trail are blackish brown or sometimes reddish in color, eroded into cavities and small pinnacles, with some covering of green, yellow and orange lichen, but overall the place is not particularly photogenic. Views from the rim encompass the Snake River to the east, the other butte to the south, and the St Anthony Sand Dunes to the north, otherwise all the horizon is flat, and usually hazy. The Teton Range is generally out of sight, 50 miles east, except on very clear days.